The 8 hyenas that were captured on Hwange as per our last report were transported to Harare by 3 Chinese men and were trying to export them out of the country by having them loaded on an aeroplane at Harare International Airport on Thursday 3rd November 2016. One of the captured Hyena in Hwange. The Chinese men were stopped by the Customs and Excise for trying to export the hyenas with fraudulent paperwork. The animals were in a poor state of health with cuts and grazes on their bodies from being transported in unsatisfactory cages. 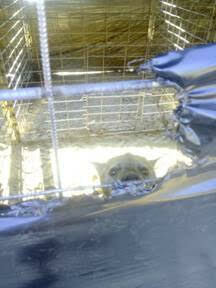 The hyena have been impounded and were released at a sanctuary close to the airport. One of the hyenas have managed to escape which will cause a huge problem to the residents in that area. We believe that there is a delegation from the Zimbabwe National Parks and theÂ ZNSPCA who will be travelling to China to inspect the holding pens for the captured animals. We sadly have to report that Katanga the baby elephant from Imire Safari Park has recently diedâ€¦our sincerest condolences to John and Judy Travers who lovingly cared and looked after him.